Jim wound line onto his Alvey, applied gentle pressure to the rod and a couple of minutes later had landed yet another ugly, silver barracouta. A small crowd of less fortunate entrants to the fishing competition looked on with envy, myself included. I was also surprised, for despite countless hours spent surfcasting and long-lining at this beach, I have never once caught a barracouta. 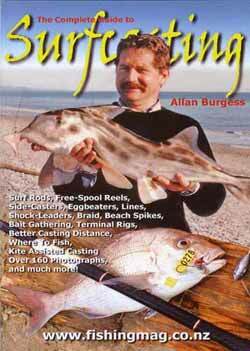 This all happened during a surfcasting competition held at Birdlings Flat, one year in mid-February. It was one of those dead calm days, with a clear blue sky and a flat, calm sea. There were few fish being caught, just the odd kahawai now and then. With the fishing on the slow side and my curiosity aroused, I decided to head the fifty or so metres down the beach to where this guy was fishing, in the hope of discovering his secret. His name was Jim Tritschler. His secret, it turned out, was to fish using small yellow-eyed mullet as live baits. I have fished along this beach with kahawai live baits under balloons, in the pursuit of sharks. But the idea of tying on little yellow-eyed mullet simply hadn’t occurred to me. The barracouta were ignoring everyone’s cut: baits and heading straight for Jim’s livies. They were only interested in a meal they had to chase first. Those that weren’t impaling themselves on the hooks were busy chopping the poor mullet to threads. The rigged mullet ready for casting. The trace is light wire. small size 14 baited hooks. On landing, the baitfish were quickly placed in a bucket of water ready for future use. Jim’s next step was to tie the livie onto a two hook rig. The formidable dental equipment of barracouta makes a steel trace mandatory. Like most predatory fish barracouta always try to swallow their prey head first. Bearing that in mind, a 4/0 hook is passed through the top lip of the mullet. A second similar sized hook, in this case, a treble, is then threaded onto the trace and passed through the back of the baitfish behind the dorsal fin. When correctly tied on, the points of both hooks face towards the mullet’s tail. The baitfish is then given a metre or so of line before tying on a swivel. Finally, the connection of a free-running ball sinker above the swivel helps to prevent the bait straying too far. One long barracouta. Experimenting with new techniques could have you catching fish you didn’t know existed in your area. 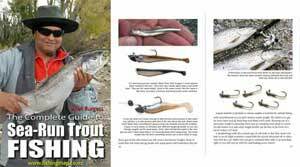 This rig has the baitfish lying along the line which helps to spread some of the casting pressure, thereby reducing the tendency for the hooks to pull out, an important consideration when attempting to cast any distance. Once in the water the mullet proved irresistible. Jim told me, that nearly every `couta is taken on the hook nearest the mullet’s head. As with all live baiting it pays to change over to fresh baits at regular intervals. A live swimming bait puts out more vibrations and is, therefore, more attractive to predators. The moral of this story is that trying different baits and rigs can have you catching fish when other methods have failed. Only three weeks before I had caught 24 sharks from this same spot. On the day I met Jim I caught only one kahawai. By persevering with the rig that had proved so successful a short time before, I missed the chance at a barracouta. The Birdlings Flat fishing competition was run by the North Canterbury branch of the New Zealand Deer Stalkers Association and sponsored by Shimano. Jim’s barracouta placed 10th and 12th out of 636 entrants. Just to prove that fishing runs in the family. Jim’s son Jessie came first in the junior section with a big kahawai. The $2,000.00 prize money for the longest fish went to Dave Sutton for his 1420 mm stingray. So don’t forget, the next time you are out fishing and things get a bit slow, have a rummage through your tackle box and try something completely different. Experimenting with new techniques could even have you catching fish you didn’t know existed in your area. Dave Sutton with his contest-winning stingray.